Use the form below to inquire about Luxury Resort on Meenkarai Road . Use the form below to reserve for Luxury Resort on Meenkarai Road . Pool Villas have private pools and a skylight bath deck. This elegant Luxury Resort on Meenkarai Road in Pollachi, Tamil Nadu offers exquisite accommodations, wrapped in exemplary opulence. A prosperous Pollachi’s verdant hillsides, sprawling tea plantations and dense coconut groves tempt you to experience an enchantingly rustic holiday with your family. Tucked into the lap of nature, this elegant Luxury Resort on Meenkarai Road is a perfect combination of peace and royal comfort. When the traveler in you has decided to set out to explore the old world charm of Pollachi’s rich cultural, religious, and scenic extravaganzas, this elegant luxury resort is perfect to play your comforting abode. After a long day of strolling through myriad shades of green, losing yourself in the swirling river banks of Valparai , exploring old temples and meditation centres around the quaint town, or encountering wildlife at renowned sanctuaries, imagine coming back to the soothing comfort of your accommodation at this resort which truly is a temple of tranquility. The accommodation here is not just well-appointed but exudes sumptuousness with voguish decor and landscaping. 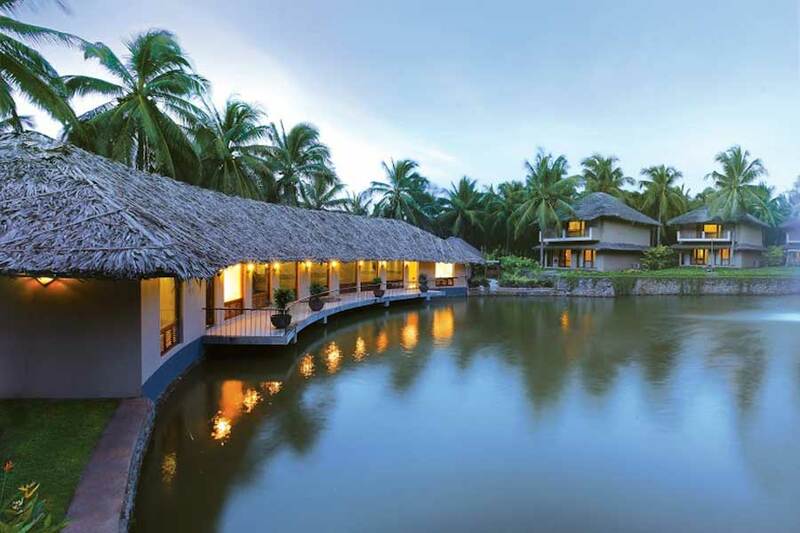 Accommodations at this Luxury Resort on Meenkarai Road are an assortment of individually-styled suites to cater to personal requirements of guests. The tones on the walls are soft and the furnishings are lavish. Pool Villas have private pools, a skylight bath deck, and cover an area of 900 sq ft. To experience life king size, try the Garden Villa with a private garden and whirlpool bath tub, the Royal Suite measuring 550 square feet, or the Presidential Suite with a private bath deck. The magnanimity and charm of these suites will leave you feeling like royalty. The restaurant with a unique architectural geometric design brings the outdoors to you. The food at this Luxury Resort on Meenkarai Road is world class and is prepared by eminent chefs. The extravagant infinity pool is a great place to unwind and relax. The huge conference room of the resort can double up as a banquet hall to host social events like weddings and engagements. The Ayurvedic spa is a haven of therapeutic programs to relax and recharge your body. Children up to age 5 will be allowed to stay free with the parents without any extra bed. Check-in is 2.00 pm and check-out is 12 noon. If you want to check-in early, or check-out late, we will be happy to oblige, subject to availability and nominal charges. Children above age 12 will be considered & charged as an adult with an extra bed in the same room. Children between ages 6 to 12 will be charged 50% of the extra adult rate with an extra bed in the same room. Standard occupancy per room is double. The maximum permitted occupancy per room will be 3 adults (or) 2 adults and 2 children in any room category. The charges for extra adult / extra child are applicable mandatorily regardless of whether extra beds are being used or not. Anyone with an open wound or other external injury is not permitted to use the pool. Spitting in the pool is prohibited. The resort is not responsible for any loss of the personal property, cash, or valuables from the vicinity of the pool. Any behavior that is considered unacceptable will result in the removal of the person [s] from the pool area. Swimsuits are available for sale at our holiday center. Kindly contact the reception for assistance. Smoking and consumption of alcohol are strictly prohibited at this resort. It is an offense to consume alcohol inside the resort premises. 30 days before arrival date – 100% refund. 15 days before arrival date – 50% refund. Experience the magic of Ayurveda at the Ayurvedic therapy centre. Yoga and meditation too are part of wellness programmes which are offered by the therapy centre. The design and decoration of the therapy centre are aimed to be soothing. A consultant doctor is available for curative Ayurvedic treatments. Treatment for stress, back pain, skin diseases, urinary disorders, gynaecological disorders, arthritic problems, respiratory disorder, hypertension cervical spondylitis, migraine, Panchakarma detox, and weight loss, healthier hair and eyesight treatment, facial beautification, post-delivery care, muscle strengthening, nerve strengthening and total rejuvenation have been proven to be extremely effective in patients. Outside the boundaries of the resort, a whole lot of adventure and sightseeing awaits you. The wild life at Parambikkulam and exciting raw wilderness of Nelliyampathy wild life sanctuaries are not to be missed while at Pollachi. This terrain is one of the most bio diverse hot spots in the entire world. Niligiri Tahr, along with tigers, makes this sanctuary popular with wildlife enthusiasts. Jungle treks, an elephant camp, a nature interpretation centre, the Thunakavadu Dam, and an eco-shop are the other attractions at Parambikkulam Sanctuary. Annamalai Tiger Reserve is another slice of wildlife close to Pollachi. Located in the Western Ghats, just south of the Palghat Gap, Annamalai too is a global biodiversity hotspot spreads over 958 square km. Top Slip is a must visit spot for bird watchers as it is home to over 250 species of birds. Bordering Tamil Nadu and Kerala, this piece of heaven is a forest reserve where bison and elephants roam free. Head to Aliyar Dam, located just a short drive from the resort for some breath-taking vistas. The dam, built as a part of Parambikulam Aliyar Project, retains a large reservoir, which resonates various shades of blue in its waters from the reflections of the gorgeously clear sky. Take a trip to Valparai, an epitome of scenic beauty. The Koolammgal River which swirls through tea gardens and meadows creates a visual treat that cannot be mimicked by many other locations. While in Pollachi, set out on the cotton trail for an out-of-the-box experience. This trip takes you through the journey of creating eco-friendly cotton products. It is a symbiotic bond between artisans and people involved in ginning, spinning, weaving, and dyeing. Pay a visit to the Temple of Consciousness, a yoga practice centre inspired by the Yogic Vethathiri Maharishi. It is cocooned amidst the stunning Annamalai mountain range. Renowned Isha Yoga Foundation, housing the ashram of Sadhguru Jaggi Vasudev too is located near Pollachi. Aruligu Masani Amman Temple which is located near the confluence of Aliyar River and the Uppar stream is a pious and serenely beautiful destination to visit. According to local legend, Lord Ram passed by this area in search of Sita. The annual Kundam festival is a major crowd puller. Coimbatore is the nearest airport to Pollachi. The distance is approximately 55 km (approx 1.25 hrs). Bangalore is about 392 km (appx 7 hrs) away while Mysore is 245 km (appx 5 hrs) away, and Kochi is 184 km (appx 4 hrs) away. From Coimbatore, drive on NH 209 towards Karpagam. After reaching Karpagam, drive on NH 83, and stay on this road until you reach Pollachi town. After reaching Pollachi, take the diversion to Rajamill road. The Rajamill road merges with Meenkarai Road.